Keeping the latest Jeeps in a similar design for each model range has helped the new Compass look in-keeping with the larger Grand Cherokee flagship range, and that’s a good thing because the styling is clean, elegant and bold. The 2018 Jeep Compass Petrol models are the nice smooth SUVs to drive. 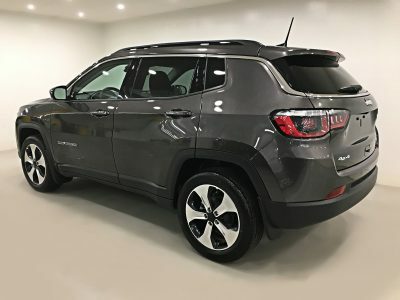 They aren’t as expensive to buy as the larger Cherokees, but they offer a good level of practical space for the occupants and luggage while remaining comfortable to travel in. Having the chance to go-bush and play in the mud off-road sounds like a great day out! You can be as refined or as dirty as you like in the new Jeep Compass – such is the wide range of abilities you’ll have at your fingertips, or should that be car keys, when you own one for yourself. There is no doubting that the 2018 Jeep Compass range looks sophisticated for a night on the town, while at the same time it looks the goods and has the goods for tackling the roughest terrains – particularly in the Limited (Petrol and Diesel) and Trailhawk (Diesel) models with their 9-speed automatic 4×4 transmission. All 2018 Jeep Compass Petrol models are powered by the grunty 2.4-litre petrol engine. With 129 kW of power and 229 Nm of torque there remains plenty of clout for everyday travel – whether loaded up or as a single-occupant commuter. Sport and Longitude models are FWD only and link their 2.4-litre engines to the robust and smooth 6-speed automatic. In the Sport model you can even opt for a 6-speed manual transmission for simple and reliable performance. 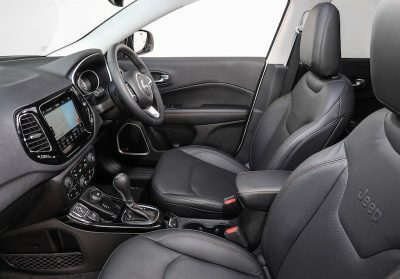 Both the 2018 Jeep Compass Sport and Longitude models come with 17-Inch alloy wheels, a reverse parking camera, 7 airbags, a 5.0-Inch touchscreen, Bluetooth phone and audio streaming, a 6-speaker audio system, Digital Radio (DAB+), a leather-wrapped steering wheel, a 3.5-inch instrument cluster display and an electric park brake. The Longitude models have a few more bells and whistles compared with the Sport packaging. Rain sensitive windshield wipers, automatic headlamps, fog and cornering lamps, roof rails, deep tinted privacy glass, bright side window surrounds, LED ambient interior lighting, power driver lumber adjustment, a fold forward passenger seat, passenger in-seat cushion storage are all nice Longitude Jeep Compass features. If you love petrol power, as well as the way Jeeps can be so totally awesome off-road, then the 2018 Jeep Compass Limited is the one for you. Superior AWD, 4×4 traction is the result of Jeeps amazing 9-speed automatic 4×4 system propelling you through the toughest off-road conditions. Being a Limited Jeep Compass version, this Jeep has some very nice features: the Jeep Active Drive 4×4 System, the Jeep Selec-Terrain traction management system, leather seats, 18-inch alloy wheels, 8.4-inch touchscreen display, satellite navigation, Apple CarPlay, Android Auto, Bi-Xenon headlamps, LED tail lamps, a premium 9-Speaker Beats Audio system including a subwoofer, a 7-inch full colour instrument cluster display, power 8-way driver / 4-way passenger seats, ParkSense front and rear parking sensors, parallel and perpendicular park assist with stop function, dual zone climate control, push button start, automatic dimming internal rear vision mirror and those all-important and loved heated front seats. Each of the 2018 models come with a list of options and accessories that can be bought to make your Compass a unique personalised machine. There are sunroofs, paint effects, alloy designs, larger wheels, boot liners, mud guards, seat upholstery options and bike carrying equipment as some of the items you could upgrade when purchasing. A brand new 2018 Jeep Compass, whatever the model, has premium 5-star safety equipment. Airbags include 2 Front, 2 Side Curtain, 2 Side Seat and 1 Driver’s Knee airbag. Cruise control, a speed limiter, a tyre pressure monitoring lamp, electronic stability control, electronic roll mitigation, traction control, trailer sway control, engine immobiliser, battery run down protection, rain brake support, passenger seat belt alert – front, passenger seat belt alert – rear and rear door child protection locks are all standard features for all new 2018 Jeep Compass models. There are optional safety features that you can add, for a price, which includes some fancy features like Lane Departure Warning Plus, Blind Spot Monitoring, Rear Cross Path Detection, Advanced Brake Assist and Full Speed Forward Collision Warning Plus – to name a few. Driving a 2018 petrol-powered Compass ensures you’re keeping ahead of the game. You’ll be driving a stylish SUV that looks good and feels great. 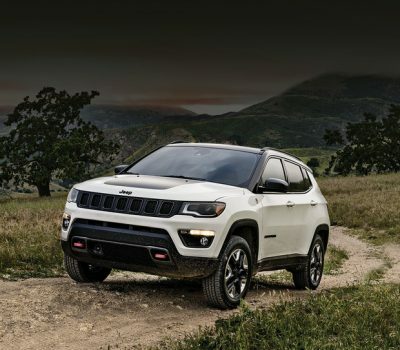 Jeep offer a 5 year/100,000 km warranty on a new Compass. For any more information on the 2018 Jeep Compass or, for that matter, any other new car, contact one of our friendly consultants on 1300 303 181. If you’d like some fleet discount pricing (yes even for private buyers! ), we can submit vehicle quote requests out to our national network of Jeep dealers and come back with pricing within 24 hours. Private Fleet – car buying made easy!